Their intention is for Michel Design Works fragrances to convey moods and set special scenes, just as their art does. They strive to offer a wide variety of both scents and designs for each season and products for every room in the house. 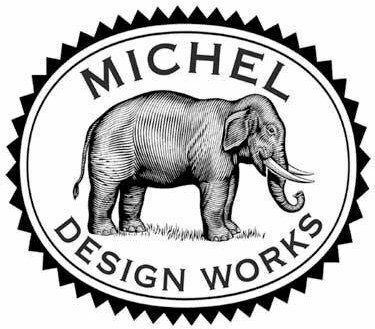 Michel Design Works was started over 30 years ago by Bruce & Deborah Michel. Their very first product was an elaborate “memory book” called Our Country Diary. It was and is a book where one captures daily events and it becomes a beautiful record of family life. The elephant proved to be the perfect logo at that time. Although Michel Design Works has greatly expanded into Bath & Body and Home Fragrance, when Bruce & Deborah remember and celebrate all of their wonderful customers and the Michel Design Works history, it is even more fitting today! Deborah Michel love fragrance, from the floral scents of her own garden to spicy scents from far-off places. And she enjoys selecting the fragrances that are featured in their candles.